Hayabusa spacecraft currently undergoes the recovery operation to resume the communication with the ground stations. It was hit by an abrupt disturbing torque owing to the fuel leak that occurred before, and has been out of the ground contact since December 9th. The project team has a good expect to have the spacecraft resume the communication soon. However, the project is now not so sure to make the spacecraft return to earth in June of 2007 and has decided to lengthen the flight period for three years more to have it return to the Earth in June of 2010. On December 8th, Usuda station observed the sudden shifts of the range-rate measurements at 4:13 UTC with the corresponding gradual decrease of signal intensity AGC (Automated Gain Controller) read. The measurement and the intensity change slowly and are currently estimated due to the out-gassing effect that derived from the fuel leak-out at the end of last month. The leak occurred on November 26th and 27th. Since the beacon signal communication resumed on 29th, the project has made an effort to exclude the vapor gas of the fuel from the spacecraft. The project has by now identified the out-gassing has successfully been performed, as its exponential acceleration decay has shown so far. On December 8th, the spacecraft was under the resume operation phase for the chemical propulsion, and was given a slow spin whose period is about six minutes. From the beginning of December, the project has introduced the Xenon gas thruster control strategy for emergency, replacing the chemical propulsion system. But the control capability of it was not enough strong for the spacecraft to withstand the disturbance on December 8th. Current estimation says the spacecraft may be in a large coning motion and that is why the spacecraft has not responded to the commands sent from the ground station. The spacecraft has been out of communication since December 9th. Analysis predicting the attitude property relating to both the Sun and Earth shows that there will be high possibility counted on for the resumption of the communication from the ground for several months or more ahead. However, the spacecraft may have to undergo another long term baking cycle before it starts the return cruise operation using ion engines aboard. And it is concluded that the commencement of the return cruise during December is found difficult. The project has determined that the return cruise should start from 2007 so that the spacecraft can return to the Earth in June of 2010, three years later than the original plan, as long as no immediate resumption tales place very soon. The spacecraft will take the advantage of Xenon gas attitude control again after enough length of baking operation. The Xenon gas that remains is adequate for the return cruise devised by the ion engines carried by Hayabusa. The Hayabusa web page will report anything updated, as soon as it becomes available. Hayabusa spacecraft is designed to allow the spin-stabilization and the attitude will converge to a certain pure spin around its high gain antenna axis ultimately. About the current state affected by the disturbance on December 8th, the attitude is conceived not to meet either of the Sun and Earth geometry requirement in terms of power and communication. Once the coning motion damps, there will be some high probability that the spacecraft spin attitude satisfies both the power and communication conditions in several months. A long term predict is given in Reference-1, which infers the probability is well assured for the resumption. There will be little possibility that the spacecraft position is out of the deep space antenna beam width for at least several months. The Hayabusa system is designed to be initialized even once the whole power is down. Actually, on November 29th, the Hayabusa system restarted as these procedures functioned as prescribed. There has been come up with a new trajectory synthesis that makes the spacecraft return to the earth in June of 2010. (Reference-2) Without immediate communication resumption, the project thinks it should take this new schedule soon. The figure below shows the attitude area that meet both power and communication conditions until March of 2007, when the spacecraft is supposed to restart its return cruise. The chance of acquiring the spacecraft signal is not low but around 60 to 70 %. 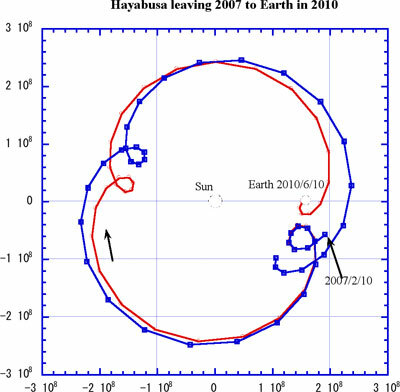 New trajectory (red line) leaving Itokawa vicinity in spring of 2007, returning to Earth in June of 2010 is shown here. The Xenon gas consumption meets the current amount that remains. There will be some strategy needed and left for the operational discussion on how the attitude is protected against unexpected disturbance. Provided the attitude changed randomly affected by the disturbance torque, here is shown the chance of having the communication resumed based on the power availability and communication conditions. Cumulative probability column P0 shows the chance becomes higher than 60% by the end of 2006. And as P3 shows, the resumption will take place most probably up to April of 2006 and next from December of 2006.